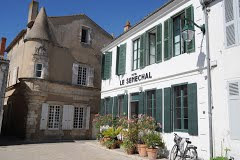 There are plenty of hotels in the beautiful villages on the Île de Ré but ensuring you get to stay there can be tricky! Most hotels will be full in the months of July and August with bookings made well in advance. Out of high season it is a little different and you should be OK to find a room. 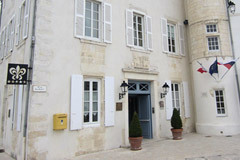 As is the case nationally throughout France, hotels on the Île de Ré are usually graded from 0 to 5 stars. 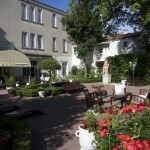 The Logis de France website lists hotels in the Charente Maritime including the Île de Ré at the following address: Logis de France. These will be a guaranteed quality and are not necessarily expensive. 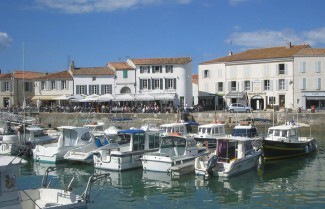 This hotel is located on the harbour, in the heart of La Flotte. 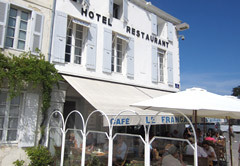 It has a restaurant and terrace overlooking the harbour and guest rooms with views out to sea. Each of the hotel’s guest rooms has a private bathroom, TV and free Wi-Fi . Some rooms are only accessible via an elevator. The Français restaurant serves fresh seafood dishes for lunch and dinner, and also a healthy buffet breakfast in the mornings. This budget hotel is 2.8 km from the beach, 5.5 km from the Phare des Baleines lighthouse and 11.3 km from Golf de Trousse-Chemise. Rustic style rooms with exposed brick walls, wooden floors, en suite bathrooms and free WiFi. Some rooms add fireplaces or terraces. Heated outdoor pool with a sundeck and lounge chairs. Breakfast (extra charge) is served in a casual dining area. A redesigned 18th-century house, this spa hotel is 1.8 km from Plage de la Cible and 18.8 km from Phare des Baleines lighthouse.Nautically themed rooms feature free WiFi and flat-screen TVs. Elegant suites add seating areas and Nespresso machines. 2 seasonal outdoor pools, with 2 aqua bikes and a poolside bar. The plush spa offers a Turkish bath, relaxation room with various treatments. Gym also available, with fitness classes on request. Overlooking the harbour and a 4-minute walk from its sister property, Villa Clarisse, this hotel in a 17th-century shipbuilder’s house is 1.1 km from the beach at Plage de la Cible. The elegantly styled, individually decorated rooms, often with old-world period furniture, have both harbour or garden views, free Wi-Fi and minibars. In-room massages are available (fee). Suites add sitting areas; some have fireplaces and/or marble bathrooms. Dining options include a gourmet restaurant, a lounge and a tearoom. There’s also a garden, outdoor seating and valet parking (fee). Guests have free access to the seasonal heated outdoor pool at Villa Clarisse.